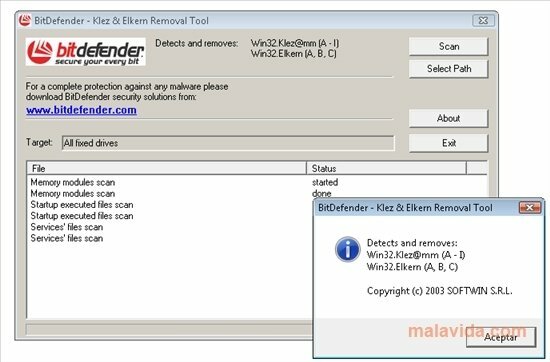 Klez Removal Tool is a simple utility developed by the BitDefender team, that has been designed to get rid of the Klez Trojan, one of the most dangerous threats in Internet history, that affected thousands of users from all around the world, and caused irreparable damage to computers all over the planet. This threat, as well as being very dangerous for your privacy, was also a danger for that of any friend, workmate and family member, because once you had been infected it used your Outlook, ICQ and Eudora contacts to spread, send mails without any text and with the virus as an attached file. This application will take care of analyzing our hard drive in search of threats and neutralizing them. It has an interface that is very easy to use and using it properly doesn't mean any kind of complication. 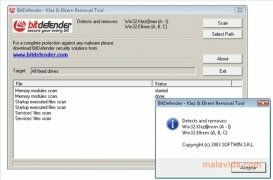 Download Klez Antivirus and remove any trail of Klez from your computer as soon as possible.